Contributing editor Vicki Schneider reminds readers that it’s natural for artists to fear the unknown and get stuck in making familiar things. One of the most rewarding things about creating glass art, however, is not being afraid to try new techniques. Learning them can sometimes be scary, but the returns are enormous. 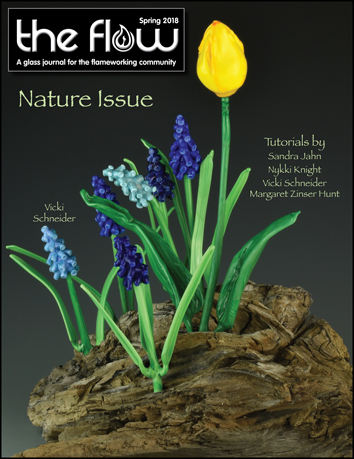 The Flow Spring 2018 Nature Gallery features the work of 45 flameworking artists. This collection showcases beautiful and innovative glass art that includes designs featuring beads, jewelry, and sculptural work of birds, sea animals and wildlife, florals, trees, and various plants plus fantasy and mythical themes. The motto of the Art Glass Invitational (AGI) is, “We are all teachers, and we are all students.” Hosts Tom and Elaine Doner welcome glass artists each year to their Glass Blowing Center in Hilliards, Pennsylvania, to learn from demonstrations in a multitude of techniques presented by well-known artists. Houston Center for Contemporary Craft (HCCC) will be presenting Light Charmer: Neon and Plasma in Action through May 13, 2018, at the center. Featured is the work of ten artists who create a spectacle of light, color, and movement amid a renewed interest in neon and plasma sculpture and performance. Jeremy Sinkus shares his discoveries in using borosilicate glass to create artisan made gemstones. 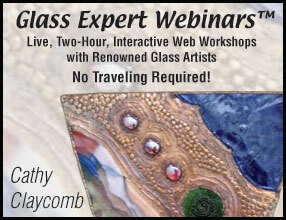 By layering several different colors of transparent glasses and applying a technique he discovered to texture the glass, Jeremy was able to replicate tourmaline, his favorite mineral, to near perfection. The glass can be faceted or used in blown applications. Bavarian artist Magdalena Paukner creates colorful glass jewelry that glints and glistens in the morning light. Her glass necklaces and other glass decor items are filled with tiny flowers and berries. Descended from a family of glassmakers, the artist believes that nature is the best model for her own glass art. Photos Courtesy of Paragon Industries, L.P.
Arnold Howard provides answers to questions from readers on various aspects of the electrical requirements for installing a kiln. Included are pointers for installing electrical kiln shutoff boxes and using the correct wire gauge, plugs, and voltage for kilns. What Is a Voodoo Queen Doing Living in the Wilds of Canada? Laura Donefer shares her adventures in collecting a wide range of “found” treasures that find their way into her glass art creations. The artist is well-known for her Amulet Basket series that represent the various seasons and was recently invited to take part in the 2017 Hangzhou Contemporary Glass Exhibition in China. Pipe Classic recently celebrated its twelfth year in Burlington, Vermont. Since its inception over a decade ago, the Bern Gallery’s Pipe Classic has come to symbolize the synthesis of form, function, and craft. The most recent competition combined seven returning artists and five newcomers, striking a solid balance between experience and enthusiasm. Nykki Knight demonstrates how to incorporate Glow Rods into a project to form the base for a panda head. Black and white glass rods are used to add the facial features. To finish, clear rod is added to create the bail for hanging the pendant. Sandra Jahn demonstrates creating a pendant featuring an American Eagle in flight. Dark brown and white glasses form the main body, head, and tail, with black for the wings. Finishing touches for the eyes, beak, and talons are made from Opaque Yellow. Tips for adding raked details for the feathers are offered. Pearls of wisdom are offered to help flameworkers navigate the fascinating world of glass art. Suggestions include moving the glass in the tool instead of the tool around the glass, noticing the creative possibilities all around, and being willing to put aside work for a few moments to connect with another person. Vicki Schneider demonstrates creating grape hyacinths to celebrate the arrival of spring. Attachment spots are added to the stem for the leaves. A flower foundation piece is then formed, and the individual blossoms are added before attaching the flower head to the stem. Tips for adding color detail to each blossom are included. 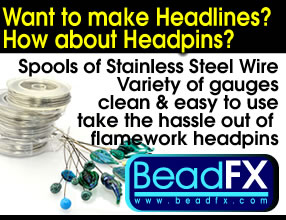 Information on the latest in new glass types and colors, supplies and tools, kilns, books, patterns, and anything else that glass artists and enthusiasts need for working in hot glass can be found in the What’s Hot section of The Flow. Margaret Zinser Hunt demonstrates techniques for creating stylized butterfly wings that can be used in pendants and earrings. Borosilicate glass is used in this tutorial, but the wings can also be made from soft glass. A diagram is included showing the various parts of a butterfly wing required for a more realistic look. Readers share their thoughts on profiles and articles featured in recent issues of The Flow.